I am Renee and this is my 6 month old son, Alex. 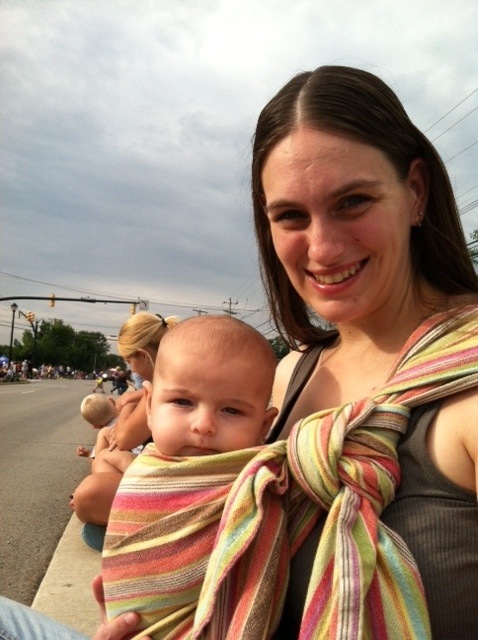 We, along with my husband and other 2 children, walked from our house to see the local festival parade on August 10. My oldest (6 yr old) is unable to walk, so her daddy wore her in our kinderpack while I carried the baby in a converted tablecloth wrap. We all enjoyed the parade; seeing the different entries, listening to the bands and collecting candy. After the parade, my 4 year old was too tired to walk back home, so I tandem wore: 4 yr old in a second kinderpack and baby still in the tablecloth wrap. I love the closeness with my kids and the ability to go where wheels don’t.